This is a long post. But I think if there is a topic I would like to devote too long of a post to, it is this one. This is a question that in the past several years has been increasingly asked by theologians. One would think that this is something that only someone unfamiliar with Christianity would wonder, but some Christian thinkers who are quite familiar with Christianity have realized that what is needed is a fresh reconsideration of just what the gospel is–with as much precise attention to detail as possible, and with as much Scriptural support as is available. Several books have been written in only the past couple of years that are aimed in this direction. 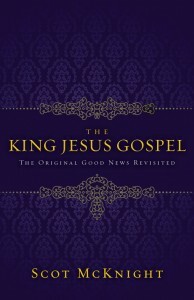 One of them is Scot McKnight’s The King Jesus Gospel: The Original Good News Revisited (Grand Rapids: Zondervan, 2011). McKnight is the Karl A. Olsson professor in religious studies at North Park University in Chicago. He is the author of many books, and I know from what I’ve read of his work that he has a habit of being relevant, witty, easily comprehensible, and, quite simply, correct about what he has to say about the Bible, the church, and related matters. Two forewords written by eminent Christian thinkers N.T. Wright and Dallas Willard lead things off. Wright sums up the major point of this book: “that the movement that has long called itself ‘evangelical’ is in fact better labeled ‘soterian.’ That is, we have thought we were talking about ‘the gospel’ when in fact we were concentrating on ‘salvation'” (12). Now hold on. If you were thinking that the gospel is (or almost) completely about salvation, and you’re willing to consider that this might not be the best way to think about it, then this book is for you. Yep, it’s already clear that this book is making a big claim. A big claim about a big topic that may mess with what you believe to be true and have for a while. Yes, it probably is. But this is hugely important, and McKnight is not actually making any large claim that many other theologians have not been making for some time–it’s just that McKnight’s book is the one of the most accessible products of these scholarly conversations. Now, don’t freak. This is not about twisting, distorting, exaggerating, neglecting, or completely rejecting what you’ve always held to be true. This is about, as Wright says, about the “full, biblical gospel” (13). This is what McKnight helps us to see. In his preface, McKnight discusses the way most of us think of evangelism. Nearly all of his Christian students tell him that the gospel they heard growing up was mainly that they were sinful, but Jesus died to take care of their sin, and so now they could go to heaven. But something was off. These same students tell McKnight repeatedly that something was lacking. Surely, the say, the gospel of Jesus wants more from us than our one decision to get sins taken care of so we can be ok until we can go to heaven. It is the message cited above that is responsible for how Christianity got obsessed with people making decisions. The center of it all has been seen as the need for the individual to make the decision to accept Jesus so they can go to heaven. As McKnight is going to show, this is not how it has always been. The original apostles had no decision obsession–they had a disciples obsession (18). Making a decision, or making a disciple. It was the latter that was the mission of those who first announced the gospel to the world. But put that aside for the moment. How has the decision method been working? McKnight cites the stats: 75% of Americans have made some kind of decision to accept Jesus, but only 25% of Americans go to church regularly (church attendance being the most convenient, albeit somewhat faulty to measure dedicated discipleship) (19). At the most conservative of estimates, the church loses at least 50% of those who make decisions for Christ. And all of us who have been in evangelical circles even if only for a short time know that this is indeed the way things are. We all have seen people make a decision for Christ and then only a little while later are nowhere to be found within the church body and there is no sign that they are in fact a follower of Christ. This is a significant problem, whether a church acknowledges it or not. (McKnight says there is something “profoundly wrong” with this ). And it’s significant enough that we need to address the question: Is it a problem with the gospel? Or is it a problem with the way we have shared and responded to the gospel? McKnight, of course, goes with the second option. Our focus on getting people to make decisions (i.e., “accepting Jesus into our hearts”), he says, “appears to distort spiritual formation” (20). But that’s the way the church has always done things! Right? Well, no, and the church has always been and always will be in need of reform. So, there’s plenty of signs that show us that things are a bit off in the way we share the gospel. But the big question is still, What is the gospel? “For most American Christians, the gospel is about getting my sins forgiven so I can go to heaven when I die” (27). Is this it? McKnight knows that what he has to say about all this is going to be hard for many evangelicals to swallow. So he says plainly: “Evangelicalism is a gift to the church and the world” (28). One of this theological system’s most valuable positions is that each must person must make a decision to be saved, as an individual. This is a thoroughly biblical conviction. Way to go, evangelicalism. But as much as evangelicalism is a gift, “it’s far from perfect” (29). What’s interesting is that the word “evangelical” is directly derived from the Greek euangelion, usually translated “good news,” or “gospel.” The original meaning of the very word “evangelicalism” reflects a commitment to the gospel. Irony is that McKnight’s point is that evangelicals nowadays aren’t very … evangelical. In the sense of being committed to the biblical gospel. A better word to describe evangelicals today is “soterians,” because, we mistake personal salvation with the gospel (29). This emphasis on personal salvation has led to an obsession with the question “Are you in or out?” (30) Simplifying (and distorting) the gospel down to this one issue is one reason for the huge problem noted above, that so many churches struggle to get the people who have simply made a decision to be discipled as believers of Christ (32). Be honest. We’re almost being audacious to expect people to stick around and go deeper when we’ve presented them with the pressing issue of being in the “in” group instead of the “out” group. We’ve made being “in” as one of the saved people the main and practically only important opportunity available to people, and when they aren’t interested in anything more, we’re surprised?? Maybe the gospel isn’t just about personal salvation. If it is, as I like to say, then we have a ridiculously large Bible. Quite simply, 99.9 % of our Bible is extraneous and unnecessary if the one great truth that we are to gain from it is that we should accept Jesus so we can go to heaven. Well if the gospel is not about crossing this threshold of personal salvation then what is it about? It’s about a story. The gospel only makes sense when seen within what is so often ignored in our preaching and teaching: the story of Israel. As McKnight points out (37), what we so often draw from the Old Testament is that Adam and Eve messed things up. Once we got that down, we can speed ahead to the New Testament where we pick out the texts that tell us we can make a decision to solve what Adam and Eve messed up and too often ignore the other ones. There’s a big story here. And a big Bible tells us about it. This story centers not on personal salvation but on God, the God who created human beings to reign as his image bearers on earth. The story is about the God who works within the human race to reinstate them as image bearers once the original ones failed. And this huge story has a consummation; again, not in your personal salvation, but in the establishment of God’s kingdom on earth, the city of Revelation 21-22, “a flourishing, vibrant, culture-creating, God-honoring, Jesus-centered city” (36). Yes, personal salvation is in there somewhere. But it’s not the whole story, and it’s not the center. Jesus is. McKnight therefore places the story of Jesus under the larger heading of the story of Israel. It is the story of Jesus that brings the larger story of Israel to its fulfillment. What is important to see is that it is only because the story of Jesus is the completion of Israel’s story that the story of Jesus is salvific. To pluck Jesus out as a generic savior for mankind apart from the entire overarching story to which he has come to us does not work. It is under the story of Jesus that McKnight places the plan of salvation–i.e., what is often mistaken for the gospel itself. Yes, McKnight’s point is that when we have shared the gospel as the sequence of facts that we are sinful, Jesus has taken care of sin, so that we can trust in him and be saved, is not in fact the gospel but only one corollary of the gospel. And, yes, because of this, “because we preach the Plan of Salvation as the gospel, we are not actually preaching the gospel” (40). I would mend McKnight’s point here a little to add that it’s not that we never preach the gospel, but that we’re not preaching the gospel when we think we are. More on this later. So, maybe this loosening up on the centrality of salvation is shocking to you. Still, McKnight points out, “The good news is that the more we submerge ‘salvation’ into the larger idea ‘gospel,’ the more robust will become our understanding of salvation” (39). As McKnight launches his biblical case for his argument concerning the true nature of the gospel, he begins with Paul. As it turns out, the best place to look in the New Testament concerning a definition of the word “gospel” comes in one of Paul’s chapters, 1 Corinthians 15. Paul begins, “Now brothers, I want to remind you of the gospel I preached to you, which you received and on which you have taken your stand. By this gospel you are saved, if you hold firmly to the word I preached to you” (vv. 1-2). And what does Paul remind them about the gospel? McKnight summarizes: the message of the gospel is that Christ died, Christ was buried, Christ was raised, and Christ appeared (49). This is a strange description of the gospel. Where is the part about me and my salvation? Where are the steps I need to take so I can go to heaven? We are helped by realizing once again that a gospel (euangelion) is an announcement, not a plan of salvation. It’s good news (49). For Paul, the gospel, the good news, was about Jesus, in his dying, rising, appearing (50). This is the fulfillment of the story of Israel and all of the promises God made to her (51). “Because the ‘gospel’ is the Story of Jesus that fulfills, completes, and resolves Israel’s Story, we dare not permit the gospel to collapse into the abstract, de-storified points in the Plan of Salvation” (51). Here, again, we have a proper emphasis on the story, not on the plan of salvation. And a key aspect of this involves remembering that the story of Jesus “is a complete story, and not just a Good Friday story” (53). McKnight cites on the following page a remark from one of his students about the heavy emphasis placed on all the details of Jesus’s death when sharing the good news in many evangelical churches. No remark about the resurrection, and certainly no sign that Jesus’s life had anything to do with it. Not only is McKnight about to spend a chapter arguing that Jesus himself actually did preach the gospel (because in most definitions of the gospel, this would hardly make sense), but he says at the end of the book that one of the ways we need to work to become more attuned to the biblical idea of the good news is that we need to soak ourselves in the Gospels (153). While not among the most neglected books of the Bible in our preaching and teaching (I can name many books that are), the Gospels certainly are far under-estimated for their importance. For Christians who think that the only thing that really mattered about Jesus is that he was God incarnate who died on a cross, most of the Gospel narratives simply don’t figure in to our understanding of the good news. I can testify to this myself. So what is the gospel then? Finally, McKnight comes to the point where he makes a positive claim about the actual nature of the true biblical gospel. Having established that it’s not about me but about Jesus, and not about a plan of salvation but about a story, he says that “If I had to sum up the Jesus of the gospel, I would say ‘King Jesus’ [hence the title of the book, The King Jesus Gospel]. Or I would say ‘Jesus is Lord,’ or Jesus is Messiah and Lord'” (56). This is about as simple as one can get the gospel, just see Romans 1:1-4 for an explicit biblical example of this. And we are also helped out by the comment makes toward the end of this introductory section of his letter in 1:16-17. There Paul refers to the gospel (euangelion), saying that it is the power of God eis soterian, i.e., “unto salvation”–in other words, the gospel leads to salvation for those who believe but is itself not synonymous with salvation. The trick is that people already assume that they know what “gospel” means, so when they read Paul using that word, they think he means what they mean. McKnight cites N.T. Wright’s comments on this issue: “I am perfectly comfortable with what people normally mean when they say ‘the gospel.’ I just don’t think it is what Paul means” (58). The gospel is not how one is saved, though there is nothing wrong with thinking about how one is saved. The gospel is instead an announcement, the announcement of Jesus’s lordship as the culmination of the story of Israel within the story of the entire world. The problem is that we “turn the story of what God is doing in this world through Israel and Jesus Christ into a story about me and my own personal salvation” (62, emphasis McKnight’s). Then the story of God and his entire world becomes only about having one’s guilt-removed (75). That is absolutely tragic. Yet for many people that’s the essence of Christianity, or at for all practical purposes it is. It is for this reason that one can properly see how Jesus indeed preached the gospel. If the gospel is the Pauline doctrine of justification by faith, or that Jesus died for your sins so you can go to heaven, then you’ll search far and wide for Jesus saying much about that. But if the gospel is a fulfillment of an expansive story, that the crucified and risen Jesus is the King of Israel and the Lord of the world, then Jesus’s entire mission is a gospel mission. The Reformation rightfully focused on certain topics for its time, but, again, not to say that the church doesn’t constantly need reform because it does (that is what this post is all about), the Protestant Reformation is over. Justification by faith was exactly what the church needed to focus on during that time in history but what happened as a result of that was that we have put justification by faith at the center of Paul’s theology, much less at the center of what we think of as the gospel, and there it it has remained. The center of Paul’s theology is most assuredly not justification by faith, but Jesus as Messiah. And being “in Christ” is highlighted much more often as the mode of salvation, not justification by faith. After all, it’s being “in Christ” that one must do to be a saved person–not believing that we are justified by faith. So, justification by faith is one way to describe how Jesus’s story is salvific, but is not itself the gospel. First-century Palestinian Jews, those who first heard Jesus teach would not already have in mind the Pauline articulation of justification by faith. But they would understand the gospel as being about the coming of God’s kingdom; indeed, they were waiting on it. Here is where it is important to know what it means to say Jesus is Messiah and Lord. As McKnight says, “much of the soterian approach to evangelism (133) today fastens on Jesus as (personal) Savior and dodges Jesus as Messiah and Lord. If there is any pervasive heresy today, it’s right here. Anyone who can preach the gospel and not make Jesus’ exalted lordship the focal point simply isn’t preaching the apostolic gospel” (134). I think this is the reason why Messiah has largely lost its meaning in contemporary usage. It does not mean Savior, at least not directly, and it does not itself mean that its referent is God. It means “anointed one.” (“Christ” is the Greek translation of this idea.) And one of its primary connotations in early Jewish usage was the idea of the rightful king of Israel. Kings would be anointed, see the story of David in 1 Samuel for example. Israel had been promised that it would have a kingship that would be established forever, but through centuries of exile/foreign rule it did not have such a kingship. The expected and awaited rule of the Messiah, the rightful and proper king of Israel, would be the age of the kingdom of God. This is the time of things being the way they should be, of things being good for Israel, and by extension, of things being good for the world. Jesus is Messiah means Jesus has come to sort out the world and rule here. The problem is, our personal soteriology is orthodox enough that we know we need a divine Savior, but our theology proper isn’t expansive enough to know that we need a king. McKnight says a couple pages later: “Remember that the fundamental solution in the gospel is that Jesus is Messiah and Lord; this means that there was a fundamental need for a ruler, a king, and a lord” (137). Indeed, the repeated question in the Bible is not “How am I saved?” but, as McKnight puts it, “‘Who is the rightful Lord of this cosmic temple? '” The answer is, Jesus. That’s the good news. And he redeems and restores the original plan for people to reign on the earth alongside of him. So yes, sin is a problem. But the fix for it is not motivated by a selfish (and need I mention way short-sighted) need to avoid a negative afterlife and have a positive afterlife; it is motivated by the original plan for us to be rulers and priests for God (142). Here’s another key part of this. When we say that Jesus is Messiah of Israel, and he is also the Lord (or Master) of the world, and what this means is that he reigns, this does not mean that he reigns only in heaven. It doesn’t mean that he reigns only in my heart. It means that he reigns over all. Just as we have misunderstood “Messiah,” “Lord,” and “gospel,” we have misunderstood “kingdom of God.” This does not refer to what we commonly think of as heaven. It refers to God’s very reign itself, and the idea in the New Testament is that in one sense the kingdom of God is coming on earth, and in light of Jesus is in another sense already here. The Christian hope, therefore, is not that we will escape our bodies and the earth to go off to heaven, but that we will be raised to new life in resurrected bodies to go with a renewed creation, i.e. a new heavens and new earth. Other times, if someone realizes that “kingdom of God” refers to the reality of God’s reign and not necessarily to heaven, they still don’t know what to do with it since they still think of heaven as being the goal of our existence. One former pastor of mine almost got it right one time. I could tell he understood the kingdom of God as referring to the reign of God, but the most he could do was say that it’s about the reign of God in our own hearts. What else could he say? He didn’t realize that the kingdom of God is coming on this earth. McKnight quotes Michael Bird on this: “Nero did not throw Christians to the lions because they confessed that ‘Jesus is the Lord of my heart.’ It was rather because they confessed that ‘Jesus is the Lord of all …'” (144). I’m well aware that this is lost on many modern Christians, and today’s church has borne the consequences of misinterpreting the Bible and missing this. Among these consequences are the overemphasis on personal salvation, the belief that we’re going off to heaven when we die and putting that at near-central if not central importance, and neglect of the pressing issues facing the world today that Christians are called to address. There are many more. This is a crucially needed paradigm shift, and this book is one example of how this shift is going to happen. But this is at least another whole post in itself. If you’ve read or skimmed or even skipped down this far, thank you. I know this has been nearly a book in itself, but I strongly recommend you read McKnight’s book. He fleshes out what I have touched on here with much more biblical support and gives a good bit of guidance to us in the right direction. Basic point. The gospel is not about you being saved but about the lordship of Jesus. Key ramification is not about making a decision to accept Christ to go to heaven but about signing on board to anticipate and herald and bring in the kingdom of God that is coming on earth whether you like it or not. Salvation is involved, but it is not an end in itself. It is a means to everything a human needs to be to please God and make him known in his kingdom. It is only in this proper understanding of the word “gospel” that we can appreciate St. Francis of Assisi when he said “Preach the gospel at all times and if necessary use words.” If the gospel is about making a decision to go to heaven, this is incomprehensible. If the gospel is the good news of Jesus being Lord of the world, then Francis has given us a stellar piece of advice. In the last part of his book, McKnight does give us his own guidelines for making ourselves more familiar in belief and practice with the actual biblical gospel. One is to become well-acquainted with the church calendar. If you go to a church where you hear nothing about Ash Wednesday, Lent, or the season of Pentecost, this will be harder for you to do. But you can do it in your own life. McKnight says, “I know of nothing–other than regular soaking in the Bible–that can ‘gospelize’ our life more than the church calendar” (155). Again, if you go to church that knows nothing of the church calendar, you probably know nothing of the great creeds of the church either. Look up the Apostolic and Nicene Creeds. Recite them and learn them (156-57). Many churches today do not properly emphasize the holy sacraments. Baptism and the Eucharist (or Communion, or Lord’s Supper, or Mass) are too often ignored and misunderstood. Study these. Realize why we do them, and what they are for. Each time you witness a baptism, renew your own baptismal vows. Each time you share in the Eucharist, realize why you do so. McKnight’s last advice is to say the Lord’s Prayer. For some Christians this is common sense. For many others, however, never is the Lord’s Prayer said in communal worship and therefore probably never said in privacy. The Lord’s Prayer is a beautiful prayer thoroughly in touch with the grand story of which we are a part. Jesus gave it to us for a reason. We should pray that his kingdom would come on earth as it is in heaven. Amen. Even if one did a quick word search of euangellion to see the cultural context (both Jewish and Greco-Roman) in which it was derived (see especially Isa 52:7-10 as well as the Priene Inscription), then one would quickly realize that Evangelicals have not heralded the euagellion on its own terms, but rather transported Pauline soteriology (if you can even say that) into an equation that allegedly represents the gospel, namely: A) you are a sinner + B) you need to be saved= C) place your faith in Jesus’ death and resurrection and you can escape from this evil world to heaven when you die. Sorry, soteriological ideologies peppered with Gnostic escapism will not do.